It’s been established in the world now that TV mounts are the new big thing and having them isn’t just good sense; it is the obvious choice. If you’re still debating, here’s why you must have one. You will not face a single hiccup in your attempt to install a wall mount as long as you follow the steps that Fleximount provides you with. We’re assuming you own a TV, or know what TV you would be purchasing. Know that most TVs follow VESA standards. They are usually either VESA 75, or VESA 100/200. This represents how far away the holes at the back would be where you would fix the mounting bracket. Our mounts come with a variety of VESA compatible sizes and it should be fairly easy to choose one. If you do not own a VESA compatible TV, we have a number of choices for you as well. Feel free to contact us if you still feel confused. Print the rules and checklist that Loctek provided you with. See where in the room you wish to place the TV. Where would you get minimum glare. As a rule of thumb, the angle from the source of light should not be equal to the angle where you will be viewing from. Typically, 40”-45” off the floor is the perfect viewing height. Use the VESA bracket provided to you. Place it on the wall and trace the holes of the plate on the wall with a pencil. This is where you would drill later. If there’s a stand on the TV frame, remove it. Now that your TV has bare holes, attach the bracket to the back of the TV with the screws provided. Make sure both the brackets are level. Affix the bracket to the arm of the wall mount and keep the TV aside, screen upwards. Measure the distance of both the points on the wall from the ground to ensure they are even and so is the distance between them. Take a power drill and make holes for wall bracket screws or bolts. Attach the wall bracket plate to the wall using the screws or bolts provided. Take the help of a companion, and while one person lifts the TV, the other connects the cables as per they go. When the cables are attached, you can align them with the cable management system to make organize them better and then install the plastic cover to hide them. These models are available with a cable management system. Lock the TV mounting arms onto the bracket plate. Make sure everything is locked properly and the first time you let go, make sure you let go slowly in order to ensure that you fastened everything properly. These are some small pointers that we have noticed are very helpful while mounting the TV. Never try to attach the TV on the mount yourself. It’s always good to use someone’s help in fixing the TV. When you drill the holes, make them 1/8 inch smaller than your screw. This way, you wouldn’t have a loose hole and even though you’ll have to force the screw in a little harder, it’s going to be much more firm. 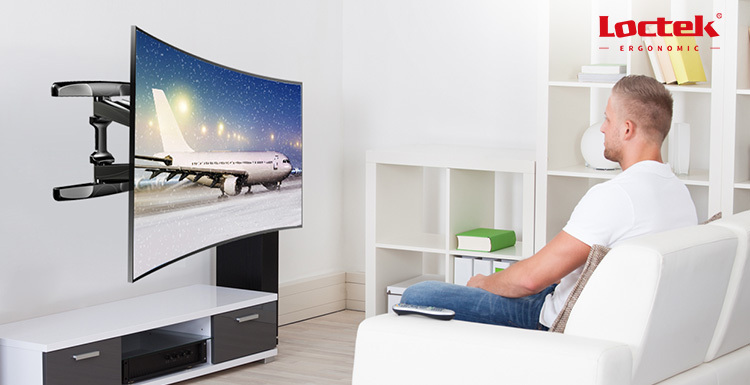 Make sure you have the right mount and that your mount is compatible with your TV. And that should do it. No need to worry, no need to panic. Extremely easy to mount that beautiful TV on the wall. Of course, if you still have any worries, we are here for you.